Leon, La Maragateria, Astorga, Castrillo de los Polvarazes, Cacabelos, Cebreiro, Portomarin, Castaneda, Santiago de Compostela, and more! 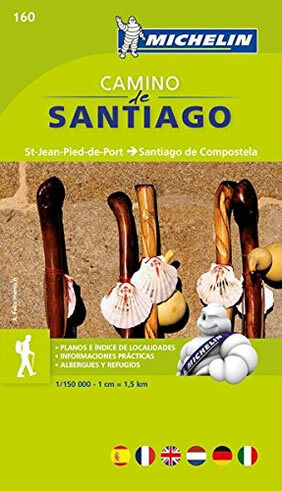 A Pilgrimage of miracles made by millions over the centuries, that is the Santiago de Compestela! One of the most amazing experiences one can have in a lifetime, and we will do our gay Spain tour without the walk, but riding from place to place with our new best friends. Since the bones of St. James the Apostle were reputedly discovered here in 813 AD, all peoples from thieves to bishops, beggars to Popes, writers to priests, why even the fabulous Shirley MacLaine have made this famous pilgrimage! Martin Sheen, Emilio Estevez, Anthony Quinn, the list goes on and on... Our tour will follow The Codex Calixtinus, the first ever guide book, written by a monk in the 12th century and still the main source of info for Pilgrims today. Along the journey we will stop in inns, guesthouse and even a monastery as we complete our quest in relative comfort and style! 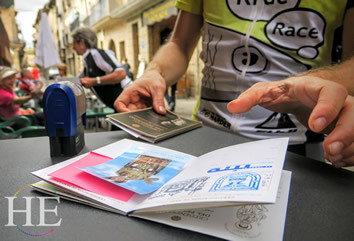 Come Early for a - French cycling trip! Join us for Colors of Burgundy Gay Biking Tour. 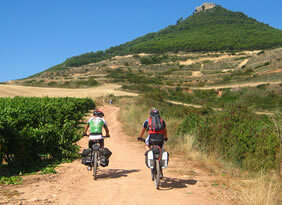 Cycle through hills and villages rich in history, redolent with the scents of forest and vineyard. Visit Chateauneuf, Roman ruins, medieval towns, and important sites in Catholicism. Burgundy is famed for its food and wine, so dining and wine-tasting will be as much fun as the biking! Day 1 - Welcome to León! 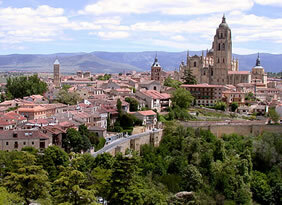 Our tour starts at the one-time capital of Spain and one of its most beautiful cities, León. This magical city was ruled by many different tribes through the ages, from the Romans to the Goths to the Moors, and each one has left its mark on the city’s culture. This afternoon we will prepare for our gay pilgrimage with a bike fitting. We’ll collect our “compostelas,” the official pilgrim’s passport, and then tonight we’ll dine with our new friends on local specialties in a restaurant with one Roman wall! Our ride today takes us into the beautiful region known as La Maragatería – home of the mysterious Maragatos, a curious subculture of mysterious origin thought to be the descendants of Phoenician slaves brought to the region by the Romans. With a long history of muleteering, today they keep very much to themselves and have elaborate celebrations and unique costumes which we will be lucky enough to get a glimpse of! Their Cocido Maragato (a type of chickpea stew) and mantecadas (little buttery cakes) are famous all over Spain and we will savor them! We end up in Astorga with its 15th century flamboyant Catedral and its neo-gothic and fairy tale like Palacio de Gaudí, designed by the famous Catalan architect himself. There is lots to do here, including the famous glockenpspiel of a Maragatan lady & gent on top of the town hall that come out and bong the hour on the hour! Chocoholics take note, we will also visit the Museo del Chocolate and learn of it’s amazing history in this region! After breakfast, we head onward and upward! After a stop at the most typical of Maragatan villages, Castrillo de los Polvarazes, for a peek into the lives of these mysterious people. Maragatan life Then it’s in to the wild! The beautiful mountain range of Montes de León separate the provinces of León and Galícia. Along the way we find many small hamlets – some deserted and almost unchanged since the Middle Ages. 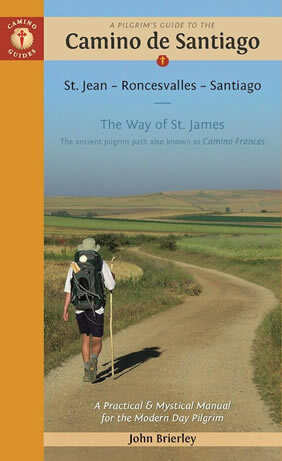 Many say that the “feeling” of the Camino is at its strongest along this stretch. 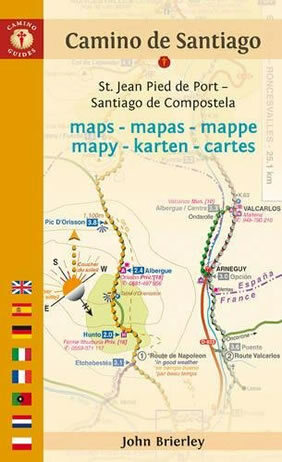 After Rabanal del Camino, the 9th stop on the Codex Calixtinus, we’ll tackle the uphill mountain climb! One of the most interesting sites along the way is “El Cruz de Ferro” of “the Iron Cross” planted centuries ago and surrounded by a mountain of stones. Many pilgrims bring a stone from home to leave with the many thousands of stones already there as a sign of leaving behind a burden, or letting go of something in your life. Let it go already! Tonight we end up in wandering the winding streets of Cacabelos, a medieval town with wine some say will scorch your very soul, so use caution! We’ll also visit an impressive castle built by the Knights Templar! Beautiful green Galícia awaits us today as we climb toward the charming little hamlet of Cebrierop famous for it’s straw-roofed stone houses called pallozas, many of which have been carefully restored. Cebreiro is also famous for its cheese – a type of cream cheese that they traditionally eat with a sort of quince paste called membrillo guaranteed to be one of the most delicious cheeses you will ever taste! It was here that perhaps the most famous miracle of the Camino took place in the 13th Century involving a doubting priest and a faithful shepherd. You will learn about this amazing occurence and why the chalice preserved here is called “The Holy Grail” by many scholars. Tonight we meet for a group dinner with a flaming surpise at the end, and no, it’s not a drag show! We’re now in the lush gentle country of the Galícians A Celtic people with their own language, gallego – which sounds like a mixture of Portuguese and Spanish but, in fact, pre-dates both of them. You will notice the change in the music, culture and even countryside and may feel like we have been magiacally transported to Ireland instead of Spain. The culture here is steeped in fantasy and superstition and in these hills paganism and Christianity easily intertwine Witches stirring their brews in misty forests mesh with accounts of miracles performed by St James, with unusual religious festivals performed throughout the year. On our way to our stop tonight at Portomarín high above the Miño River we will he great Monastery of Samos, one of the most ancient monasteries in Spain. Tonight we’ll have a chance to rest our weary legs at a very comfortable country inn w/ views of the Miño River, and try some Paella. You will find some of the best in Spain here! After a hearty breakfast, we ride out through small Galician villages with their curious horreos (granaries) that resemble crypts. Like going back in time, nothing in this intensely agricultural area has changed for centuries. They still workwith the most primitive agricultural tools; oxcarts with solid wooden wheels are still a common sight on many little roads In many of these farm areas, the people still wear the typical wooden shoes, which they claim are far more comfortable and practical than other shoes Pottery is simply formed and fired just as it was in Roman times. Behind the veil of the gentle bucolic land lurks some lurid history. At one time it was a hotbed of vice and lechery with servants taking pleasure in seducing weary pilgrims for illicit gain! Both Pilgrim and servant caught in this debauchery we not only excommunicated, but also stripped of everything and exposed to public ridicule, after having their noses cut off!” Medieval justice was swift and sure! As we ride through hills on our way to our accommodations in a typical Galician Country Manor House, we pass through Castaneda where many pilgrims would bring stones from the previous night’s stop to aide in the constructin of the Cathedral. Don’t worry you’re off the hook. Take heart – the end is in sight! 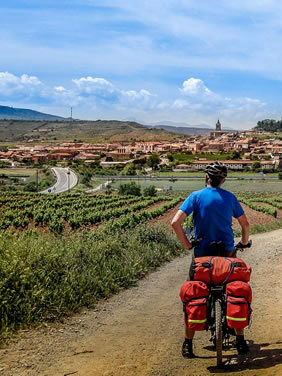 Today’s ride is a short one in order to give you more time in Santiago On this day, the Camino is very palpable – you’ll see hundreds of pilgrims all rushing in the same direction and the excitement will be tangible and certainly infectious. Just before we ride into Santiago, we’ll skirt around the town of Labacolla, which the name means literally to “wash your arse” Those earthy Galicians! In the 12th century the monk wrote of a river called “Lauamentula”, where pilgrims on their way to Santiago take off their clothes and, for the love of the Apostle, wash not only their private parts, but the dirt from their entire bodies! We won’t be forced to go that far… Upon reaching Santiago de Compostela, just as millions of pilgrims have done for over a thousand years, we’ll stand in the Portico de Gloría, place our hands in the Tree of Jesse and gaze at one of the jewels of the Middle Ages and a towering monument to man’s faith. There’s lots to do and see here and we will happily direct you to all the important sites to visit. To get your certificates, take your passports around to the right side of the Cathedral and you have made it! Tonight we meet together for the last time to celebrate life and new friendships along with the completion of our quest with a Galician Celebratory Feast! 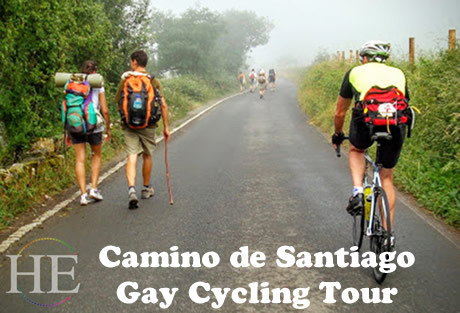 Our gay Spain Camino de Santiago cycling tour ends today. We hope you will have a safe journey home! This tour starts in León and ends in Santiago de Compostela, Spain. Most people fly into Madrid (MAD) and then take the train to León. The high speed train takes 2 hrs and 16 min and runs regularly throughout the day. At the end of the tour, you may like to fly home from Santiago de Compostela Airport (SCQ) or take a high-speed train back to Madrid (the journey is about 5 hours). 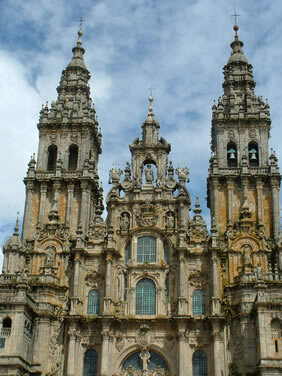 Cycling along the Santiago de Compostela is a moderate challenge. You should be comfortable riding in warm weather over rolling to hilly terrain 35-45 miles per day. During our ride through the countryside, we will be staying in small, often ancient guesthouses where countless travelers have come before us. Some accommodations are simpler than others, but all are welcoming and comfortable, with a rich history to share with those who visit Spain to experience this pilgrimage.